The roof on your home is one of the most vital parts of the home. Without a proper roof on your home the interior of your home will face all sorts of problems. When roof leaks start occurring on your home and the walls and ceilings start to show signs of damage it’s likely time for a new roof on your home. For home owners in Howell Michigan, Livingston Roof Pros can help with your new roof installation. 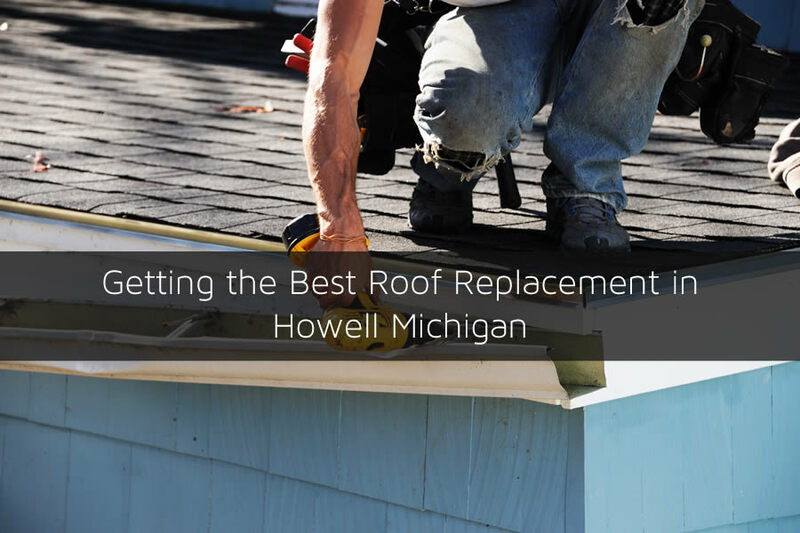 We’ve included some tips for the best roof replacement in Howell Michigan in this article to help you. At Livingston Roof Pros we can install a variety of roofing materials on your home. One of the most common types of roofing materials used in Michigan today is asphalt shingles. Asphalt shingles have been used for decades and they continue to be one of the best ways to cover your home. But if you’re in the market for other types of roofing we also offer metal roofing and tile roofing as well. Talk with one of our roofing experts today to learn more about the options that we offer here at Livingston Roof Pros. For home owners that have asphalt shingles installed on their home you may have the option to re-roof or resurface the roof. This simply means that the existing layer of asphalt shingles can be left on the home and a new layer of asphalt shingles is placed directly on top of the existing layer. This method of roofing can save money on your roof but it does have some drawbacks. Plus, if your home has been reroofed previously, only 2 layers of asphalt shingles are allowed on the home and you’ll need to use the other method of roofing which is tear off and roof replacement. When shingles are removed from the home and the roof decking exposed it’s known as ‘shovel off’ or ‘tear off’ roofing. This allows a much better job because it allows the roofing contractor to fully inspect the roof decking which may not be possible with re-roofing. Tear off roofing is more expensive than reroofing and may require additional debris removal as well. Getting a quote on both methods can give you a better idea of just what you should do with your home’s roof and the method you should choose. Even if you don’t choose Livingston Roof Pros to install your new roof in Howell Michigan make sure the roofing contractor that you use if fully licensed and qualified to install the roof. Many times home owners will choose cut rate roofing companies to install a new roof only to realize that it fails in just a year or two. What’s even worse is that because of improper installation you may not even have a warranty on your home’s roof. Always make sure the roofing company that you choose is fully licensed and qualified for the roofing materials that will be installed on your home. Almost all types of roofing materials that are sold today have some type of warranty associated with them. Of course, that warranty is likely only going to be honored if the product was installed correctly by a licensed professional. Ask your roofing company about the warranty of products that will be installed on your home’s roof. You’ll also want to get this warranty in writing as well. Some roofing companies will also guarantee the labor provided as well. Any work we do here at Livingston Roof Pros is always stood behind. We pride ourselves on the customer service we offer to our clients. If there is a problem with the roof we have installed please let us know so we can make it right and keep you completely satisfied with your experience with Livingston Roof Pros. Need a quote of roof replacement in Howell Michigan? Be sure to call Livingston Roof Pros today to schedule an appointment to get a free roof estimate on your home. We’ll come to your home and inspect the roof and discuss options of roof installation with you and give you a free estimate on pricing.